Stage is set for the 13th NCPEDP-Shell Helen Keller Awards Presentation Ceremony. Dignitaries on the dais (From Left to Right): Javed Abidi, Honorary Director, NCPEDP; Ajay Maken, Hon'ble Minister of Youth Affairs and Sports; Sushanta Sen, Principal Adviser, Confederation of Indian Industry (CII); and Deepak Mukarji, Country Head - Corporate Affairs, Shell Group of Companies. Ashwin Karthik receiving the award under Category A Role Model Disabled Person. Nilesh Singhal receiving the award under Category A Role Model Disabled Person. Pradeep Raj receiving the award under Category A Role Model Disabled Person. Meera Shenoy receiving the award under Category B Role Model Supporter of Increased Employment Opportunities for Disabled People. Niranjan Khatri receiving the award under Category B Role Model Supporter of Increased Employment Opportunities for Disabled People. Thilakam Rajendran receiving the award under Category B Role Model Supporter of Increased Employment Opportunities for Disabled People. Aegis Ltd. receiving the award under Category C Role Model Companies/NGOs/Institutions. Deaf Enabled Foundation receiving the award under Category C Role Model Companies/NGOs/Institutions. ITC Maurya, New Delhi receiving the award under Category C Role Model Companies/NGOs/Institutions. Muskaan receiving the award under Category C Role Model Companies/NGOs/Institutions. Pointec Pens Pvt. Ltd. receiving the award under Category C Role Model Companies/NGOs/Institutions. Ashwin Karthik, Delivery Software Engineer, Mphasis, addressing the audience. S. M. Gupta, Global Chief People Officer, Aegis Ltd. addressing the audience. Javed Abidi, Honorary Director, NCPEDP addressing the audience. 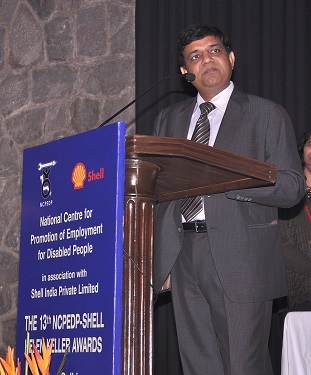 Deepak Mukarji, Country Head - Corporate Affairs, Shell Group of Companies addressing the audience. Sushanta Sen, Principal Adviser, Confederation of Indian Industry (CII) addressing the audience. Ajay Maken, Hon'ble Minister of Youth Affairs and Sports addressing the audience.